There's hardly an irony that Lewis Hamilton ended up securing a wonderful career in the top echelons of motor-racing, i.e., F1. After all, there's such a great similarity between both, the sport as well as the four-time world champion from Great Britain. While there's never a dull moment in F1, with there being so much to look forward to on each racing weekend that encompasses the chance to shake up the title fight with each passing lap, there's also never a dullness with Hamilton, both inside and outside the car. When he's in his Silver Arrows, he's either dominating the proceedings or holding the control of the race from the track position. True to his passionate self, Hamilton, it cannot be ignored, is seldom left bereft by an army of his devoted fans, who've supported him everywhere. 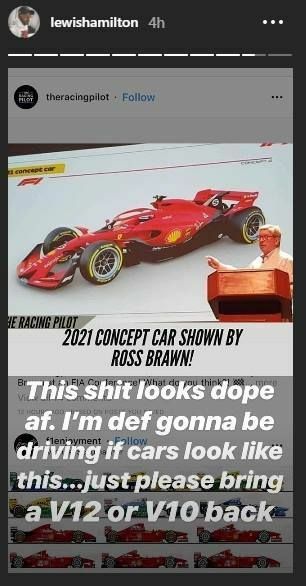 Recently, Lewis shared the picture of Ross Brawn who gave a talk regarding what might seem to be, in all likelihood, the future look of the F1 2021 cars. To his immense satisfaction, Hamilton hailed the design, stating, "It was too dope. "So it was but expected that when a green signal of sorts came from no one else but the current championship leader with regards to the 2021 F1 concept (car), his fan-base too accepted his opinion with a resounding affirmation on social media. Interestingly, while Hamilton has affirmed his liking for what truly does appear as a lean, compact speed-machine for the future, one can't help but wonder- would there ever be a day when Hamilton would be seen donning the reds? But while that answer remains in the grasp of the future, here's what is certain. 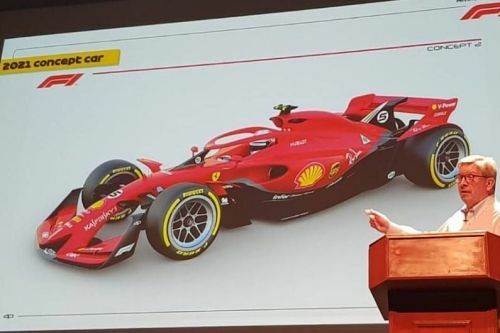 Lewis has shown his support for what clearly appears to be a futuristic mock-up of a car powered by a lean look and peppered by aggressive-looking front and rear wings. What's also interesting is to see how might the 18-inch wheels appear, that is slated to be inducted post-2020? The Mercedes driver was also seen making an earnest plea, wherein he wished for a return or re-introduction of the V10 power units.